Keep in mind, if you invested in the S&P 500 in 2000-2010, your NET return was closer to 0%. Because of the tremendous amount of volatility, which is typical of the stock market, the timing of your buy is incredibly important. Therefore, the recent correction in stocks should bring up the obvious question: Is now a good time to invest? The reality is, almost all long-term historically accurate predictive measures show that stocks are still clearly over-valued, despite the recent pull back and the incessant rhetoric we hear everyday from pundits on CNBC. Does a high P/E (price/earnings) ratio mean that stocks are going to correct? No. Many times throughout history, abnormally high P/E markets can increase for years without a significant correction. Timing your investment strategy solely on this metric can cause trouble. However, over the long run, the reversion to the mean always takes place. 1) The Crestmont Research P/E Ratio – This methodology uses the relationship between earnings per share and gross domestic product to adjust for business cycles. The Crestmont P/E of 24.8 is 77% above its 145-year average. 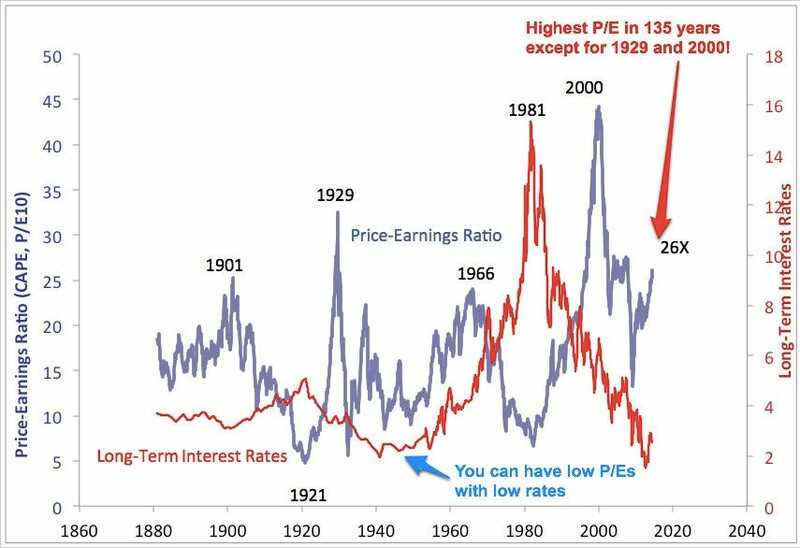 2) The Cyclical P/E (P/E10) – This metric is calculated by taking the price of the stock market divided by the 10-year inflation-adjusted average of earnings. Currently, this data suggests that stocks are trading 46% above their historical trend (current average of 24.3 / historic average of 16.6). 3) The Q Ratio – This ratio is the total price of the market divided by the replacement cost of all its companies. 4) S&P 500 Composite Trend Line – A long-term inflation-adjusted trend line of monthly average daily closes that dates back to 1871. Here we can see an average of four valuation indicators suggesting stocks are 59% above their historical mean. The last eleven business cycles (thought of as the “modern cycles”) have averaged 68.5 months. Assuming that the current cycle began in June of 2009, it has now been 80 months since our last recession. Only 5 out of the last 28 recoveries have lasted more than 60 months. The longest recovery since 1879 was 120 months. Looking at all this data, I do not see a valid way to justify claiming that stocks are a good investment right now, much less a “screaming buy.” However, I want to make it clear that in the short term it is very unpredictable which direction stocks will move. For example, you could have looked at these same metrics in 1998 and come to the conclusion that the market was due for a pull back. As we now know, anyone that took aggressive short positions in 1998, especially in the Nasdaq, would have suffered two grueling years before things started to turn in their favor. It is really important to remember, though, the vast majority of the time investors take a big bet on “things being different this time,” they lose money.